Baptism day: Forty Koreans were received into the Catholic Church on Easter Sunday when Archbishop Mark Coleridge celebrated Mass at Sacred Heart Church, Rosalie. Photo: Paul Kim. NEWLY baptised Korean Catholic Charles Park believes he was destined to become a son of God. Born Chul-soo Park in Korea, Mr Park took on the English name Charles when he moved to Australia nearly eight months ago. When he was preparing to be received into the Church on Easter Sunday with 40 Korean adults and children, he picked Carlo as his baptism name. He later found out that “Carlo” was Italian for “Charles”. “It’s destiny that I should follow my God into the Catholic Church,” Mr Park said. Mr Park used to attend a Protestant church in Korea but since living in Brisbane and attending Mass with the Korean Catholic Community at Rosalie, he thought Catholicism was “more sacred”. “I said to myself it’s a good time to look at the Church,” he said. “I decided by myself but my motivation was from my family. “If I want to be a son of God, it’s important to start at the beginning of my new life in the Church. “I think living with God is very important – I can feel safe and comfortable when I know I am with my Lord who is protecting my family and my community. Mr Park started attending Mass with his wife and, “with God’s grace”, decided to become Catholic at Easter. As a bonus, he was received into the Church by Brisbane Archbishop Mark Coleridge. “Everyone was jealous of us; they didn’t have a chance to get baptised by the Archbishop,” Mr Park said. “I think the reason I am in the Catholic Church is not up to me – God chose me. 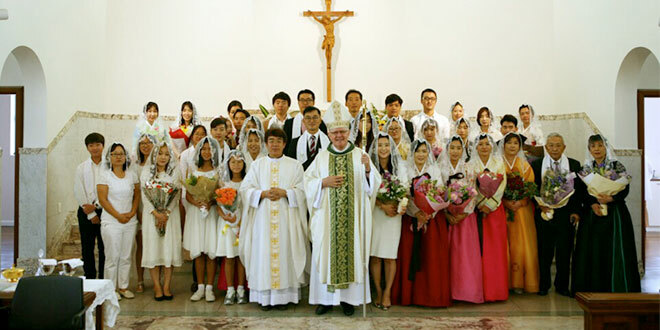 The Korean Catholics baptised at Easter were among the largest group of catechumens in the Brisbane archdiocese this year, followed closely by 19 adults and children from the Chinese Catholic community. The Korean community ran the Rite of Catholic Initiation of Adults program with resources from Brisbane and Korea. A spike in interest from Koreans could see the program run twice a year. Korean Catholic community Sunday school principal Phillip Kim credited the success to their chaplain Fr Georgius Jong Kil Kim, who came to Brisbane last year. Mr Kim said Fr Kim’s “approachable and friendly” character had impressed many non-Catholic Koreans. “Credit goes to him and the whole team who encouraged the catechumens to take the next step,” he said. Unlike other Asian countries, Catholicism spread in Korea through a lay person who came to know the Church in China. Yi Seung-Hun, one of the first Korean martyrs, found a book of the Catholic faith and after he was baptised, brought it back to Korea and preached the faith. He was beheaded in 1801. Mr Kim said this strong foundation built by the Korean martyrs inspired the faith of the Brisbane community, which has Masses every Sunday and Wednesday morning at Sacred Heart, Rosalie.